Non life-threatening penetrating wounds of the thorax(PCW) can be treated by tube thoracostomy(TT)alone, but incomplete removal of clots can delay recovery and lead to the development of empyema. We hypothesized that use of early thoracoscopy (TS), within 48 hours, will reduce empyema and missed diaphragmatic injuries(DI). Method: We performed a retrospective chart review of 82 stable patients with PCW initially treated with TT alone, and had retained clots on CXR at 48hrs or suspision of DI. 27 patients underwent early thoracoscopy with blood evacuation/pleural lavage, hemostasis and foreign body removal were accomplished when indicated. The diaphragm was assessed for defects, and when present, a laparoscopy performed to rule out abdominal injury. 55 patients had another TT to remove clot. 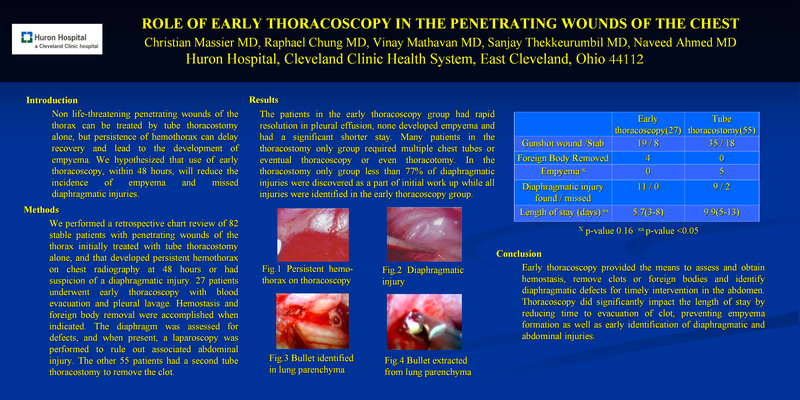 Results:Conclusion: Early thoracoscopy provided the means to assess and obtain hemostasis, remove clots or foreign bodies and identify diaphragmatic defects for timely intervention in the abdomen. Thoracoscopy did significantly impact the length of stay by reducing time to evacuation of clot, preventing empyema formation as well as early identification of diaphragmatic and abdominal injuries.